Changes in the weather, hot, cold, damp, dry, etc. 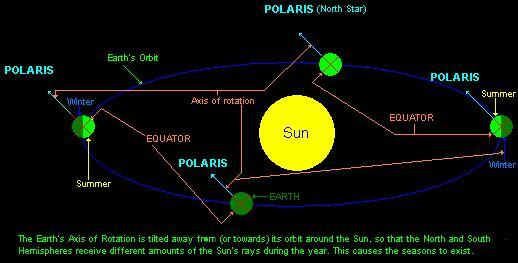 caused by the 23.5 degree angle between Earth's axis and true North. "cave man" (Cromagnon - us) over kill - humans killed off all the larger mammels. Large groups were hard to sustain so the population divided into smaller groups 12000 Ya, then we over killed the larger mammels by doing things like driving a herd of bison over a cliff to harvest a few while the rest rotted and were wasted. Poser - "have we evolved enough to prevent wars, or are we already there?" 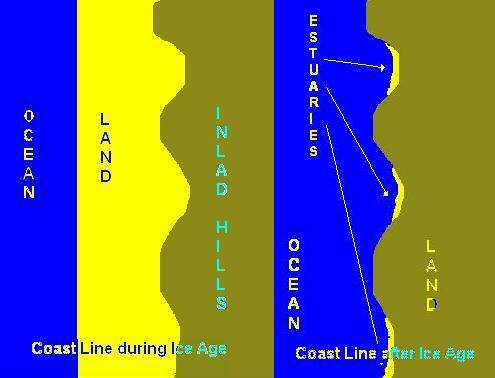 Most recent Ice Ages occured. 2. More glaciers - Parts of North America and Europe were covered. 6. The Mojave and Sahara Deserts had lakes and grasslands. Death Valley was a huge lake. 2. Many estuaries were created. 3. All lage animals went extinct - Humans ate them? 4. Glaciers retreated. Only Anarctica and Greenland have them today. 6. Humans had migration and culture problems, food became scarce - pueblos were deserted. 3. More of the remaining glaciers will melt. 4. Sea level will rise higher. 5. More geasslands will be lost. 6. Human populations and cultures will be further impacted.